Friends are important. Very much so. And my friends are certainly the very best a girl could ask for. We had dinner at Tesse and Danne, our newlywed friends, last night and they presented us with an amazing gift as a thank you for the help with their wedding. (And a combined birthday gift, too.) I'm totally floored - it was an invitation to eat a tasting menu at Edsbacka Krog, which is one of the very best restaurants in Sweden. I can barely wait - I'm so excited about this! The menu sounds delicious, and we have to set a date real soon. And of course I can't wait to tell you all about it. Another very dear friend is Lena, who's also a foodie. She's preparing for a two-week vacation driving from New York to Miami with her boyfriend Nico and friends - I'm green with jealousy, but very excited for her. She made the delicious cheesecake that Tesse also made for her wedding - I told you about it. Many of you asked for a recipe in English, so here you go! Make it - it's really tasty. This recipe is posted in Swedish here, at Lena's blog. Line a 8- or 9-inch springform pan with parchment paper. Melt the butter. Mix the kavring bread with the butter in a food processor until you have a crumbly dough. Press this into the pan. Soak the gelatin in cold water. Mince the red onion finely. Mix the cream cheese with crème frâiche and onion, salt and pepper. Melt the gelatin in a small pan with a few spoons of the cheese mixture. Stir this into the rest of the cheese mixture and blend well. Spread over the bread bottom, and place in the fridge to set for a few hours. 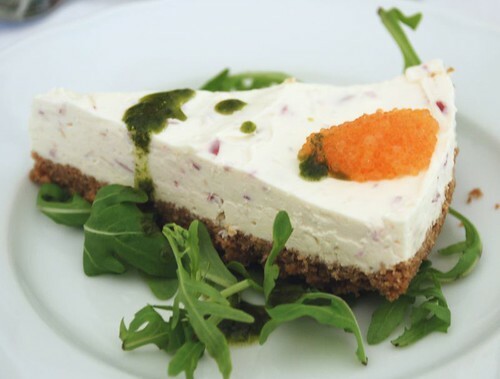 To serve, place a few rocket leaves on plates and top with a piece of cheesecake. Drizzle with herb oil and place a neat dollop of roe on top. So very glad you posted this today. Have been dreaming about making this since you first mentioned it. Surprised there are so few ingredients. Is the red onion flavour strong enough to cut through the creaminess? Wendy - you might want to add a little more red onion, or perhaps some snipped chives. It *is* rather creamy, but the roe goes very well with it. I also suspect you can use a lighter version of both crème frâiche and cream cheese if you'd wish. Oh boy! You are a lucky girl (but deservedly so for all your hard work for the wedding!). I've heard of Edsbacka Krog and I am sure you'll have an incredible meal there! I can't wait to hear all about it! Do you think I could substitue the Kavring bread with a pumpernickel. That's all I can find around here, it looks about the same; really thick and kind of biscuity.